We are fans of tacos and taco salad. 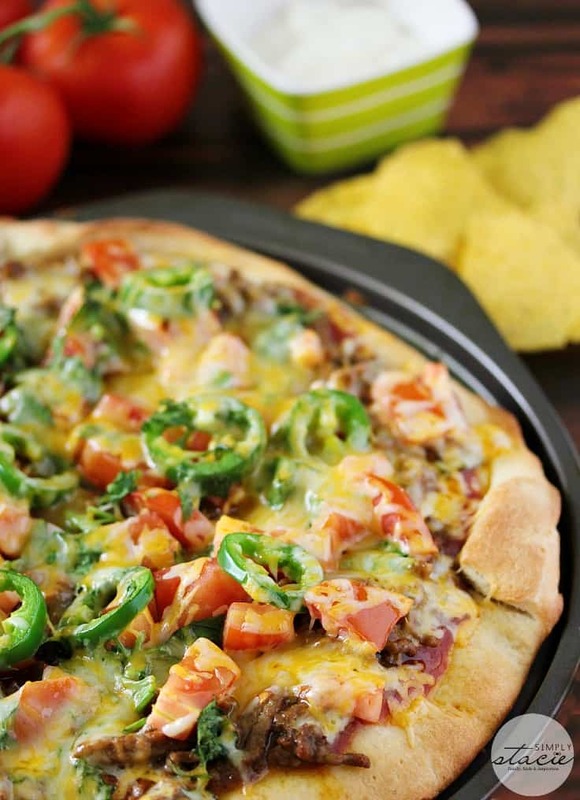 As it turns out, we also like Taco Pizza! I don’t think I’ve ever seen a pizza get eaten this quickly in my home. It was gobbled up while it was still hot from the oven. Start the recipe like you would if you were going to make a batch of tacos. Brown lean ground beef in a frying pan and then add your taco seasoning mix and water, according to the package directions. Once your crust is ready, spread on the taco sauce. Salsa would also work. 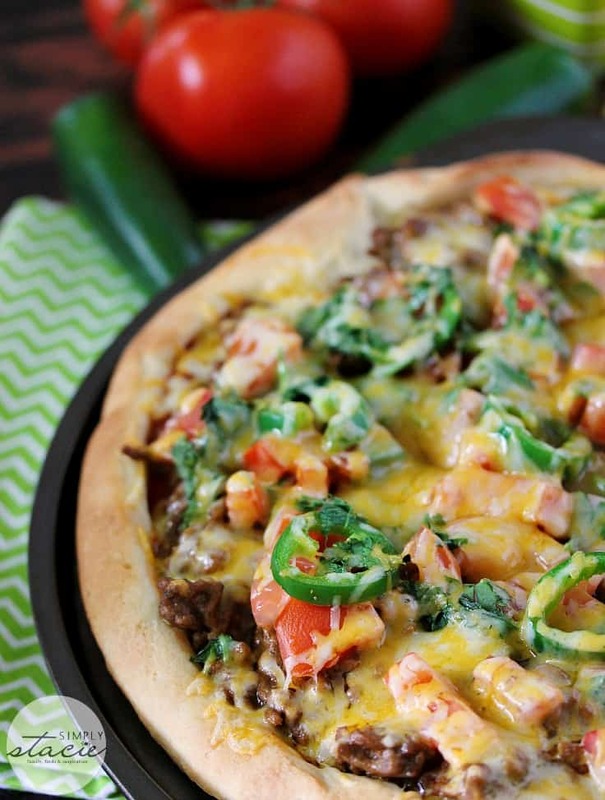 Add your cooked ground beef mixture, tomatoes, cilantro and jalapeno slices for a spicy kick. I topped mine with melted marble cheese, but regular cheddar would also be fine. I also served it with a dish of sour cream for dipping. I find the jalapenos a little spicy so I need something to cool me down! Tacos make a darn good pizza. I’m very pleased with how well this recipe turned out. It’s not as messy as eating a taco. They always break a part on me and I ended up eating the toppings and tacos separately. With this pizza recipe, if you are careful enough, you can eat it mess free. Though I think a couple toppings dropping down isn’t so bad. As long as they hit your plate and not the floor! Check out my other pizza recipes – Italian Meatball Pizza, Sweet Chili Chicken Thai Pizza, Chicken Bacon Alfredo Pizza and Cheeseburger Pizza. 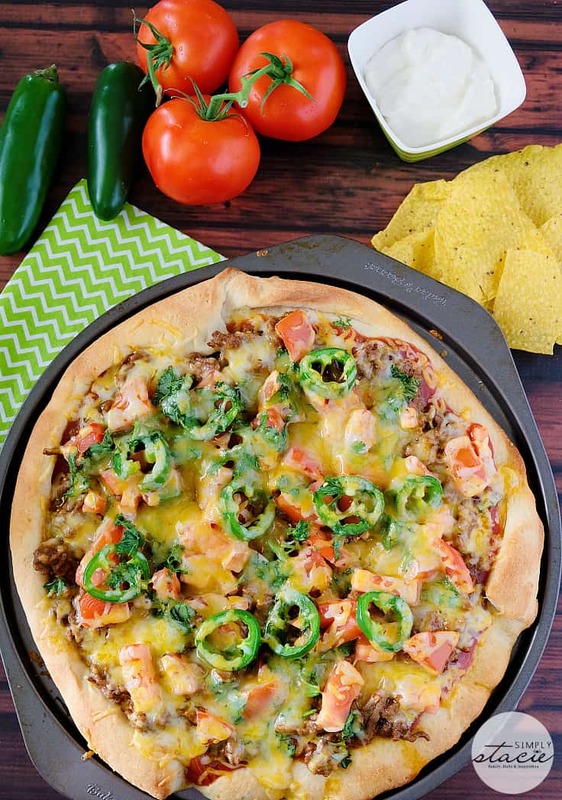 Have you tried Taco Pizza? What ingredients are in your recipe? 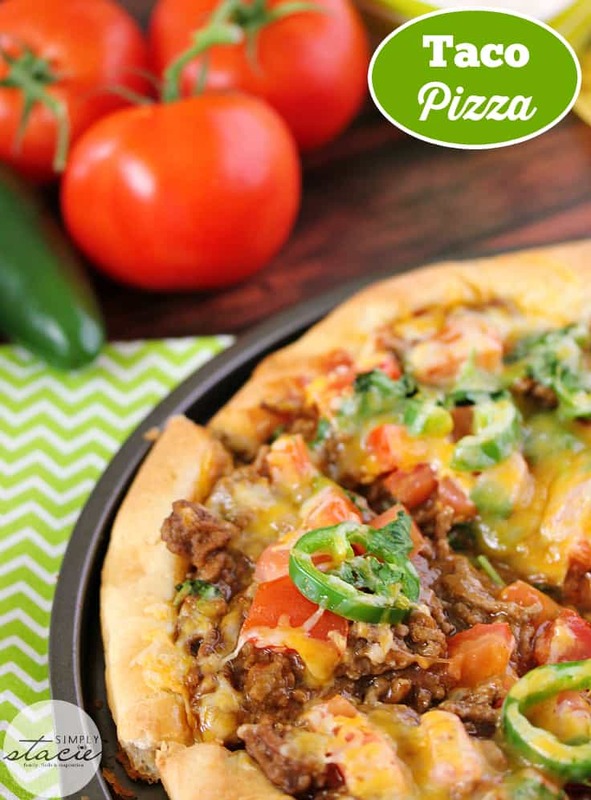 A flavor fiesta in your mouth with this delicious Taco Pizza recipe! Cook ground beef according to directions on taco seasoning mix. Set aside. Prepare the pizza crust according to package directions. For the Pillsbury Pizza Crust I used, I greased a pizza pan and spread the dough to fit. Then I pre-baked for 8 minutes in a 400°F oven. Spread taco sauce over pizza crust, leaving a gap around the edge. Evenly distribute ground beef, jalapeno slices, tomatoes, cilantro over the sauce. Then top with cheese. Bake an additional 7 to 10 minutes or until crust is golden and cheese is melted. Serve with a side of sour cream for dipping, if desired. Join the #WannaPlayChat #RoadtoRio Twitter Party on August 5! Tasty! Great version….I’d love to try this one! Two of my favorite foods in one!! I can’t wait to try this. It looks awesome! 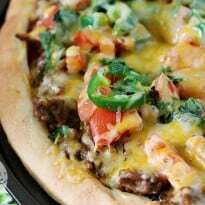 Never thought about making a taco pizza before – but it sounds like a great idea and I am sure it wouldn’t last long in my house either! OMG I’m SOO in love with this idea!!!! Gotta try. One of my favorites! I make these a lot. I’ll try your recipe! 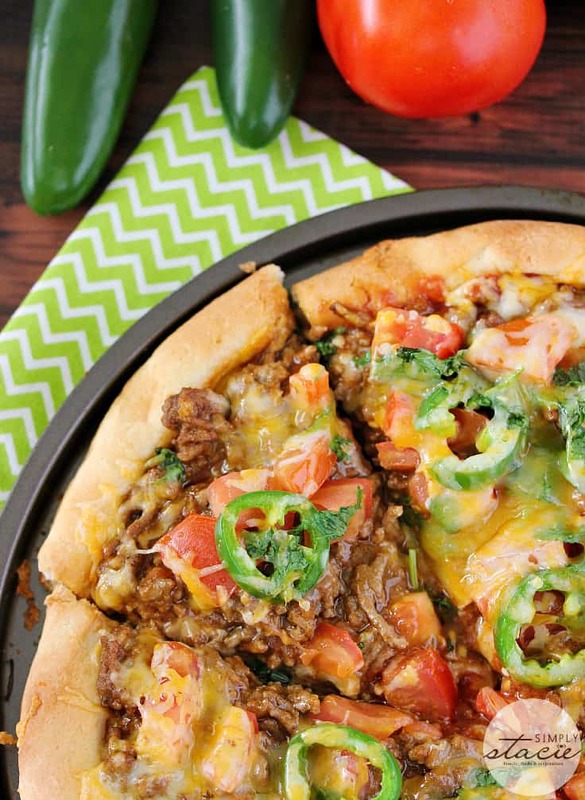 I’ve never tried taco pizza, however, this looks super delicious. Just hesitated as the price of beef is through the roof right now! I would really love to try Taco Pizza!! Looks yummy!! I love tacos and I love pizza!! To of my favorites in one! You gave me a really great idea for a party next weekend. I am going to try this recipe out. The taco and the pizza–yumm! Great idea that should be a winner in our house-can’t wait to try it! Thank you! This looks delicious and quick to put together. Bonus having tomatoes, jalapenos and cilantro in the garden. Thanks for sharing, I’m going to try this one soon! Looks amazing! Pizza and tacos are two of my quick go-to things, so a combo would be perfect! Thanks for sharing! I love taco pizza!! Your recipe looks great! I would love if you would stop by and share on my Friday Favorites linkup! Would love for you to link this up at our Tuesday Talk link up next week for our Football theme. I could see many enjoying this recipe during football season. It begins on Tuesdays at 8:00 a.m. Hope to see you there. This looks like a great thing to try for supper soon! I just love the flavors in your Pizza, it looks awesome! Hope you are having a great day and thanks so much for sharing this awesome post with Full Plate Thursday. I have never had pizza taco, I don’t like Mexican food. This would be good for people who like tacos. Thank you for sharing this recipe. Thanks for this wonderful idea. We also love tacos and pizza. I would leave out the jalapenos since we don’t like spicy. This recipe looks easy to make and won’t take long. I don’t make my own pizza crust so would buy one.